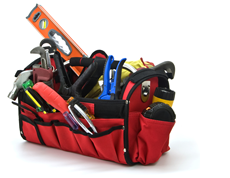 Losing your tools from the back of your van could have a dramatic impact upon your business. With tools in transit cover from Quoteline Direct, you can relax safe in the knowledge that should your tools be lost or damaged, we will pay to replace them. Imagine that your van was stolen with all your tools in the back. Your van insurance cover will replace the van, but who would replace your tools? From just £49.95 to cover up to £1,000 worth of tools, our policy would do exactly that. To take out a policy, please complete the following quotation. Your application should only take a few minutes.